Home > MapleStory 2	> MapleStory 2 Supporters’ Day #02: The World! MapleStory 2 Supporters’ Day #02: The World! A new video has been released for MapleStory 2, this time showing off the new (or I guess old…) Maple World! There was also a couple of teasers which I will cover! Also, the event in Korea for MapleStory’s summer update is in less than 12 hours from now, I’ll try to cover it as fast as I can! Here is the translation for the video above. I just wanted to say, it’s completely fine for anyone to use them but I would really appreciate if you gave a link back to the site, it would help me out a lot. Here’s the Castle of Tria, the peaceful mushroom village Henesys, the barren lands of Perion, the fairies’ town Ellinia, and Kerning City, where money is the only thing that matters. In each of these areas, there are a variety of unique challengers awaiting adventurers. The first area with blue skies and clear rivers as the peaceful town of Victoria Island, Henesys. However, in the fiels are mushrooms and pigs who although look cute, harass and attack passers-by. Residents tremble in anxiety but put their trust in their Chief Manovich and the best archer in Henesys, the vigilante Oskhal, who is committed to the safety of the villagers. Unlike Henesys, Perion has rugged terrain, sandstorms, and is known by adventurers for its rocky mountains. Despite the forces of nature at work, various monsters have adapted and survived in the hostile environment. The girl with the mysterious power of wolves, Tina, the most valiant warrior Heart of the Red Wolf and his son, Rolling Thunder, do not tolerate monsters and fight to protect their town. This is the mysterious town of Ellinia. Nestled deep in a forest, outside Ellinia are monsters that were originally fairies. In particular, you can find Slimes here. Adventurers try to talk to the Great Magician Asimov for advice but he is only worried about fairies. And there’s a special fairy named Anos who has always been smart. Kerning City is an amazing technologically advanced area. However, with their huge skycrapers’ shadows and factory chimneys spouting black smoke, there is also a dark side to the city. In these shadows, adventurers might find themselves in the alleyways of Kerning City. The people here try to make money in any way to get into the luxurious Goldus area. Forced to stand by and watch silently is Blackeye, who you might be able to trust. Victoria Island’s story doesn’t end there. Together with the blue sea and white sandy beaches, Lith Harbor is overflowing with romance. No one knows what happens in deep dark caves where light does not reach. Severe snowstorms engulf the mountains in the north. Due to the selfishness of human civilization, science experiments have created an area where nature has been corrupted. How did we create this world with so many different appearances? (Yoo Mira, backgrounds part-leader): We put a lot of detail to express the area’s uniqueness into a single rectangular block but also kept the silhouette simple. Each block meant the objects were fairly small alone, but put together they completed a larger design. (Nam Seonghee, scenario writer): We absolutely want to continue the original work’s story in the future, but I think it would be better keep MapleStory 2 as a ‘story of the past’ instead of covering things from the original. Q. How far in the past is it? In the original, 3 Overseers created the world. This will be after that but still very distant from the original. Therefore, you can continue to play MapleStory and learn more about that world, while an episode from MapleStory 2 might connect a little to it. Q. Is the Black Mage in it? No. The Black Mage was the main enemy in the original. Creating a new story is sort of hard but we are working on it. In MapleStory 2, you’ll have to defend Lapenta from enemies to keep Maple World safe. 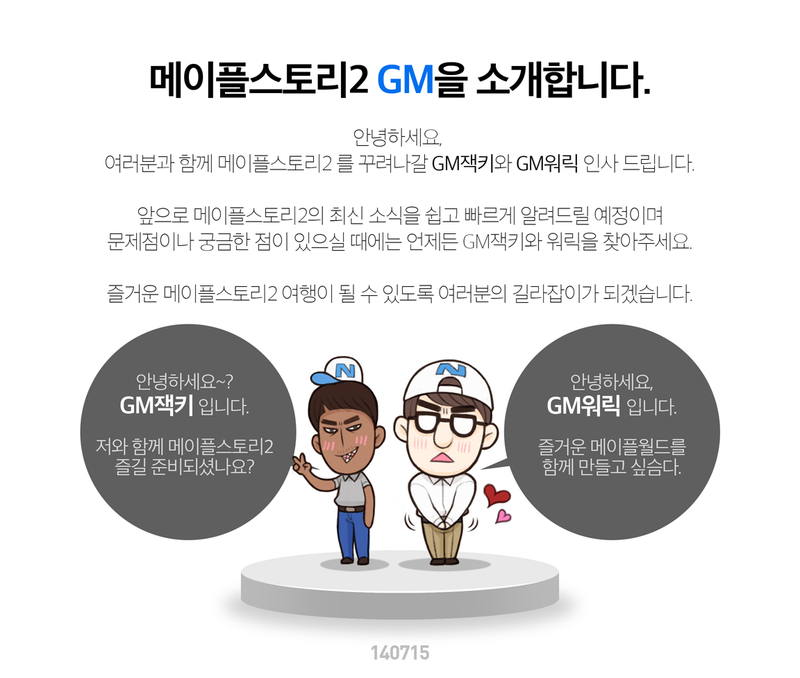 There was also one more image released, this one was the introduction of the first two GMs for MapleStory 2, GM Jacky and GM Warwick. Thanks for the updates of quality as usual, Max! Wew so close for announcement of summer update! Wew so close for summer update announcement! Cannot wait!!! Just saw Stardust Crusaders and the first thing I thought when I saw the title was “ZAA WARUDOO”. 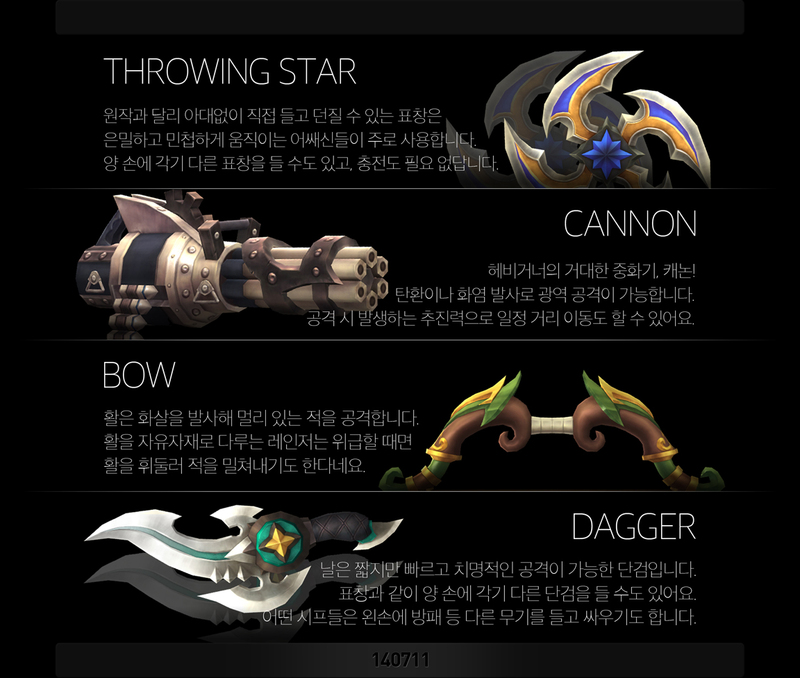 again, the dagger design looks stupid..
Looks pretty cool. Some of the town designs, namely Ellinia, don’t really look that great in cubes, but most of the areas looked really nice. Glad to see the game will be launching with a wide variety of landscapes. Those underground caves look really sick! lol Maplestory + Minecraft = Maplestory 2! In world design sure, but the similarities ends there mate. That’s really a loose similarity at best, lots of games before minecraft and now have player housing it’s nothing new but it’s still a positive aspect of the game. MapleStory 2 is nothing like Minecraft. Can anyone get this point across? I’m seriously done with this. The only thing similar with the two is that they both have blocky environments, but that’s it. When i looked at the picture of the Maplestory two world, i thought the map looked like Hyrule Castle at first for some reason. Also, wasn’t Perion just like Ellinia before the black mage killed the plants or something?. No Perion was Perion before the Black Mage’s storyline. The baddie was Ergoth and the only thing he effected was the monsters. Why is Kerning City more technologically advanced in the past than it is in the present? Who cares it still looks awesome. When I heard of MapleStory 2 and the fact that they where going to make it 3D, the first thing that came to mind was that I hope it would have been literally the same maple but in 3D not this blocky thing. It’s not bad but to me it doesn’t capture the essence of maple. What I was expecting, and what most people were expecting, was the game to be like Eden Eternal but with third person fixed back view. If they would have made it like Eden Eternal it would have been PERFECT! I think they did the isometric view to allow easy keyboard controls instead of using a mouse. and honestly I think the cubes and view make the game unique, maplestory drew me in a long time ago because it looked unique, and so does this game a lot people would probably agree with me too. Will this game be availavable to play it in english language ? or we will need to wait for a global version of ms2 ‘? This seems odd, since it both condemns the selfishness of humans who destroy the environment while glorifying the extermination of native species by humans for the sake of “protecting” towns. Such a hypocritical setting seems bland at best. oh no no no you misunderstand.. it is okay to kill and steal land but it’s not okay to poison terrain..
MapleStory 2014 Summer Update – Coordinator’s Invitation~ kMSt ver. 1.2.509 – More Skill Changes!